Parsley is native to the central Mediterranean region (southern Italy, Greece, Portugal, Spain, Malta, Morocco, Algeria, and Tunisia). Parsley is bright green in color, has feather-like leaves and is in the same family as dill. One of the most versatile herbs used in Middle Eastern cooking is, without a doubt, parsley. Parsley is also the most commonly consumed fresh herb in the United States. Using parsley in cooking is a great way to boost the taste and improve the look of a dish without adding extra sodium, or salt, to the meal. There are many varieties of parsley, but the most common are flat-leaf, also known as Italian, and curly. Curly leaf is probably the most recognizable, as restaurants often use it as a garnish on their plating, but both varieties are widely used in cooking. No herb is prettier than curly-leaved parsley. Parsley is terrific in flavoring tomato dishes, baked potatoes, various fish dishes, and egg dishes. A few parsley sprigs added to any soup, stew, or other water-based dish will enrich its flavor and add an elusive herbal bass note. Sprinkle fresh parsley just as you would use black pepper on noodles, vegetables, or potatoes. A cup of minced parsley leaves tossed with an equivalent amount of soft grains adds nutrients as well as enticing taste, or call it a green and heap it into salads with lettuce and other greens. 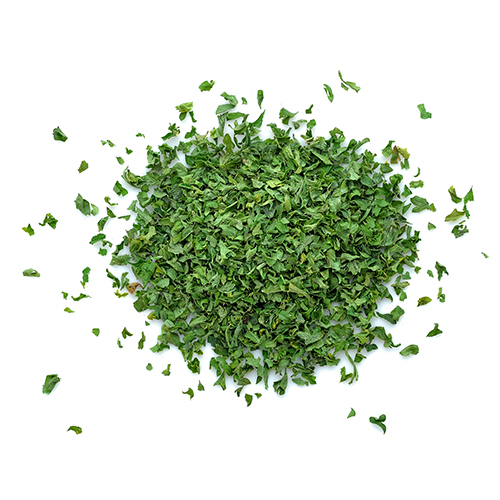 This herb blends well with other seasonings or shines when it stands alone. Parsley is a biennial plant. Like most herbs, it thrives in areas with six to eight hours of sun, although it will tolerate light shade. It takes between 70-90 days growth before the plants are ready for parsley harvesting. Once they are ready for harvest, bunch the stems and leaves together and snip them off at ground level with kitchen shears.